Over the years, Muirfield Village Empty Nesters has had the opportunity to participate in a number of social activities ranging from concerts, plays, bowling, pizza parties, exploring restaurants and evenings at resident homes. Attendance has varied based upon the interest, availability and schedules of those involved. However, the primary goal has always remained the same - to provide an opportunity to renew old acquaintances, make new friends and to create lasting memories. 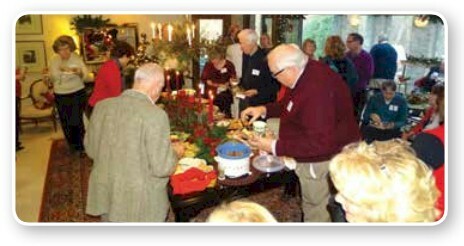 The Muirfield Village Civic Association reorganized, creating the Muirfield Social Activities Committee as a committee of the Muirfield Association. As such, we are currently planning new and exciting activities for the Empty Nesters Group. If you would like to join us to share your ideas and/or assist in coordinating activities, please contact Charlie McDowell at[email protected]. We would love to hear from you or have you join our planning and implementation group. To date, we have scheduled an Empty Nester Christmas Social on Wednesday, December 5 from 6:00 pm until 9:00 pm at The Muirfield Village Country Club. We are considering an evening of holiday music, cash bar and heavy hors d’oeuvers. So be sure to note the date on your calendar so that you can join us. Additional information regarding the event will be published later in the year. We also hope to plan wine tasting outings, a hands on cooking school evening, a yacht club potluck and several other events prior to year’s end. To provide you with an opportunity to receive Empty Nester announcements, we need to create a new mailing list. If you would like to be notified of future events, please forward your name, address, phone number and email address to [email protected]. Upon receipt, we will confirm your addition to the list. We look forward to hearing from you and hope you join us in future Muirfield Village Empty Nester Group events.